1) The bed and pillows were to my satisfactory. Room is quite clean. House keeping staff for my room is very friendly and good manner. 2) The afternoon staffs in the Business Center are helpful and good manner as well. All up to standard for 5 star hotel. Nothing to complain. Clean and comfortable rooms smacked into the heart of town. Walking distance to the malls and walking street. The Breakfast buffet is good and the staff try to be helpful but have very limited English. Room was nice. We were on the executive floor. Plenty of bottled water available. Nice hotel close to the city centre of kunming and not far from the train station. Staff very helpful especially when we couldn’t catch the train and we went back to the hotel and they organised a driver for us. This hotel comes with very good location as it is not far away from the airport and from the railway station (Kunimng Station). The bed is quite okay in size for two adults and a kid about three years old. The table and reading lamp is really useful for business travellers, and the food they offer for breakfast is really tasty, and have a strong balance between the demands from local and western customers. Nice large room, comfortable bed, even small balcony. Large gym with great selection of machines. Had issues with smell in the room which was promptly fixed, also with a fixture in the shower which was immediately repaired. Breakfast selection is huge and delicious. Location is fantastic, close to Jinbi park and the main shopping area, street with restaurants and bars very close by. 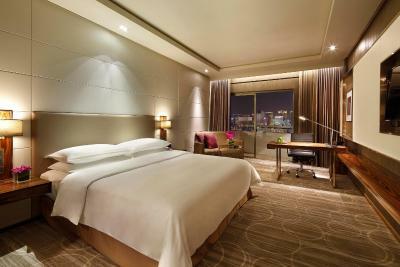 One of our top picks in Kunming.Offering an ourdoor pool, Crowne Plaza Kunming City Center is located in downtown Kunming, a 10-minute walk from Nanping Street shopping area and Dongfeng Square. It provides modern rooms with upscale amenities. Free Wi-Fi is available in all areas. 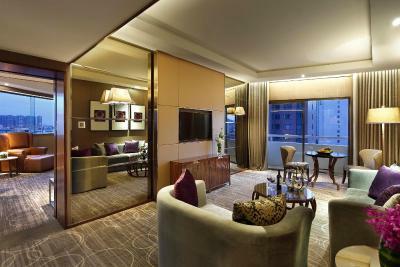 Crowne Plaza Kunming City Center is a 10-minute drive from Green Lake. 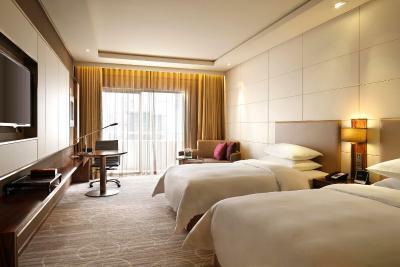 Kunming Dianchi International Convention & Exhibition Center and Kunming Changshui Airport is a 30-minute drive away. Rooms here will provide you with a flat-screen TV, air conditioning and a mini-bar. There is also an electric kettle. Featuring a shower, private bathrooms also come with a bathtub and a hairdryer. Extras include an iPod docking station and a seating area. 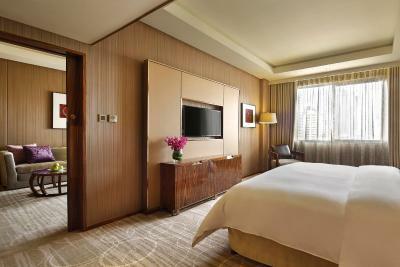 At Crowne Plaza Kunming City Center you will find a fitness center. Other facilities offered include a shared lounge, ticketing service and a tour desk. The property offers free parking. A fine selection of Chinese and Western food can be enjoyed at the on-site restaurants. 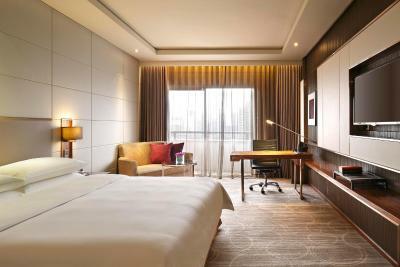 When would you like to stay at Crowne Plaza Kunming City Centre? This twin room has a mini-bar, an iPod dock and a seating area. 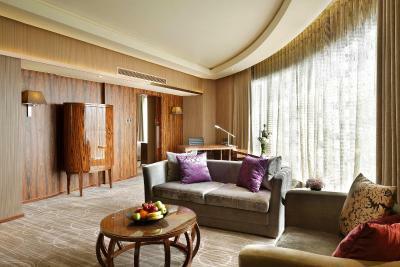 This suite features an electric kettle, air conditioning and seating area. This double room has an electric kettle, iPod dock and sofa. This suite has a bathrobe, iPod dock and satellite TV. 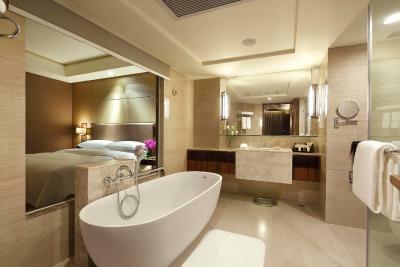 House Rules Crowne Plaza Kunming City Centre takes special requests – add in the next step! Crowne Plaza Kunming City Centre accepts these cards and reserves the right to temporarily hold an amount prior to arrival. According to the regulations of The Ministry of Public Security of China, Chinese citizens check in that only accept second generation ID as certified certification, other certifications like passport, driver license may not be accepted. Please note that the outdoor swimming pool is closed due to maintenance works. English language proficiency. Sometimes difficult to communicate on phone. Friendly and well located hotel. This hotel in not prepared to host guests and meetings at the same time. During the meeting period breakfast changes totally, lowering the food quality; I had my breakfast standing, no place to seat...; I’ve waited the elevator for 15 minutes, because too crowded. Meeting guests must have a dedicated area for breakfast, lunch and dinner! No matter if you have the DO NOT DISTURB light on, they call you by phone to make up you room. One evening I got back to the hotel my key didn’t open (red light), at the front desk they told me the deposit was not enough...I was sure I’ve paid the room charges in advance plus deposit, but they are not prepared to speak English so they took only the deposit. While I was arguing for that miss understanding one of the front desk woman asked me if I was sure I will check out the day of the booking check out, implying I was I cheater and she was so offensive to me. This woman is not appropriate to stand the customer service front desk of 5 star hotel!!! She must be fired!!! Fortunately a front desk man speaking a good English and understanding the situation made his best to solve the problem apologizing for the mess. Any way I had to pay everything in advance, room charges and extras!!! I’ll never get back to this hotel!!! Not a 5 star hotel. This is not my first time in China and in Kunming but is the fist time I’ve faced such a bad service. Service at check in was slow, need to improve. UGLIEST ROOMS I HAVE EVER BEEN TO IN A 5* HOTEL!! First, although I had arrived at 14:00 n booked 30-35 minutes earlier, I was told to wait 40 min to 1 hour before getting my room, I was swiftly shown by hand to sit at the lobby... Except the mandatory "sorry for the inconvenience", no gesture of care for the client was made, I would have accepted to wait if a gesture of good faith was made (a beverage free of charge for instance) but nothing like that, therefore I said "no I will not wait! I'm backpacking, I'm tired, I booked the room to have a good rest, it's after 14:00, you should have rooms ready!" (I could have waited 10' with no problem but "maybe 1 hour" - No!) Then, I asked to change rooms, the first one I had was dirty with stains on walls, n broken pieces of ceiling after repair. The decoration was almost all dark brown everywhere (walls, furniture, floor,...) it felt like the permises had been built in the 1900s... But no, it was much more recent than that (I asked)! The 2nd room was brighter but not because of the decoration, it was because of one floor higher on the *south* side. The view for each room was horrible... The entrance door feels heavy but is so thin we can hear anything going on outside... thus, able to guess what's going on inside. Because I asked to change rooms I was then on the side of the road, it was noisy but I'm very sensitive to noises, so that could be put on my account. Finally checking out was quite long although they were priding themselves of "fast check in, fast check out" ... Now, cherry on the cake : the swimming pool was closed for repair (RIGHT IN THE TOURISTIC SEASON... R YOU SERIOUS CROWNE PLAZA?!) n I chose that hotel for that service actually... Disappointed all the way by this so-called 5* Definitely not worth the price! !